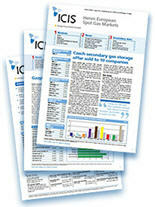 ICIS publishes daily pricing expertise for continental Europe’s most important gas market, the German GASPOOL hub. The daily insights provide readers with benchmark gas price assessments and indices, as well as analysis and news for the German spot gas markets. The information is published in our European Spot Gas Markets report, which provides the most comprehensive round-up of Europe’s gas markets. The daily report not only informs readers of market developments across the German markets, but also provides a complete picture on 12 established and emerging European gas markets including the British NBP, Dutch TTF as well as the German NCG. Analysts can access latest insights on supply & demand dynamics, competitor movements, regulatory changes & key events.